Dreams about swimming are common for many people. In this post we'll take a look at what it means to swim in a dream as well as the symbolism of swimming pool dream meaning. Since these symbols are closely related, it makes sense to talk about them both! What Does it Mean to Dream About Swimming or a Swimming Pool? Swimming is an activity many people do for fun and exercise, whether it be in a pool, lake, ocean or other body of water. Sometimes, swimming can be an act of survival, especially if one finds themselves dreaming of being tossed from a boat or falling into a body of water unexpectedly. Before we get into the common dream interpretations for swimming, it's important that you first think about the context of the dream as well as your own personal feelings and associations with swimming. There are many questions you can ask that will help you better understand what this dream is about. By asking these questions you can understand more about what the symbols may mean for you personally. How do you feel about swimming in general waking life? Was the water clear or murky? Did the pool seem large or small? Were you swimming alone or with other people? Was the water cold or hot? Did you notice any other important symbols in the dream? Was this a public or private swimming area? Taking some time to write down your dream in a dream journal can be very helpful to understand all of the different aspects of the dream. 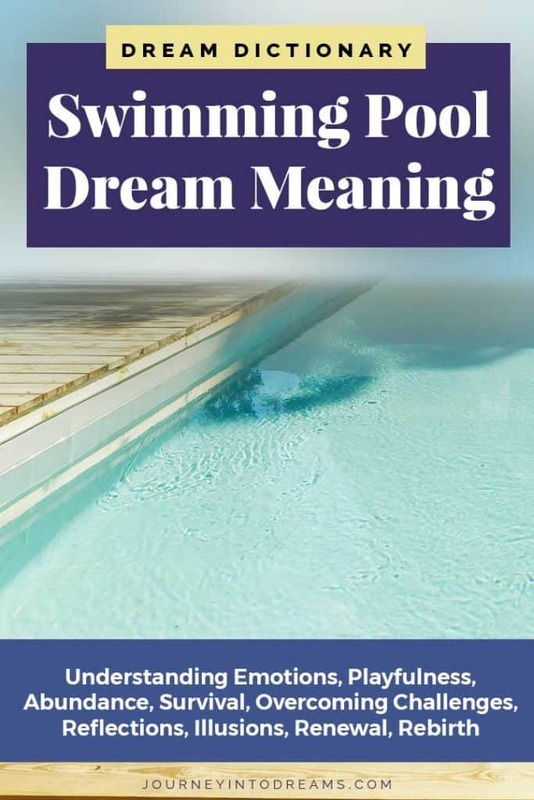 It can also be useful to identify additional dream symbols that will help you better understand and analyze the swimming pool dream. While dream symbol lookup dictionaries such as the one our website can be helpful for understanding specific dream symbols, it's important we remember to look at the dream as a whole. Chances are there are many other things that happened in the dream that will give you additional clues and context to better understand what your swimming dream means. See more tips on how to interpret what dreams mean here. Once you understand the basics of the dream, we are ready to explore common dream themes, metaphors, and symbol meanings for swimming. Most of the time swimming takes place in water. In our post on Water Dream Meaning, we talk about how water can often symbolize our different emotions we may be experiencing in life. If you have a dream about swimming in water, it can often mean that you are trying to navigate your way through different emotions. Think about current events in your life: Is there something emotional you are trying to work through? Sometimes these emotions can be happy, other times they may be feelings of uncertainty or even fear. The quality of the water in the swimming pool can sometimes give you more insight on what the dream means. If you are swimming in dirty or murky water, you might be trying to figure out how to work through different feelings or challenges in your life. If you are swimming in crystal clear blue water, you may be on the brink of success, accomplishment, or relief from tough times. It's also very important in these kinds of dreams to think about what feelings and emotions you may be experiencing in waking everyday life. Often times these thoughts and feelings will manifest into our dreams at night so we can better understand them. Many times when we are in a swimming pool we will play different games. Marco Polo is a popular game, where one person is Marco and all others must try to find the person in the water by calling out the name. If in the dream you are playfully splashing water or playing other games, this is often a sign that you need to perhaps take some time for something fun in your life! If your waking life is stressful, you may find yourself subconsciously yearning for the joyful and fun of childhood. We often associate water with birth and new beginnings. Water is also a common element used in baptism. Swimming in a dream can sometimes mean you are exploring new things in life, or wish to have a fresh beginning. Sometimes the location of where you are swimming can provide some clues on what types of things are changing or are new in your life. For example, a private swimming pool where you are alone could mean you are exploring new spiritual growth or personal growth. If you are swimming in a crowded public pool, it could symbolize you are looking to start fresh to find new friends and contacts. 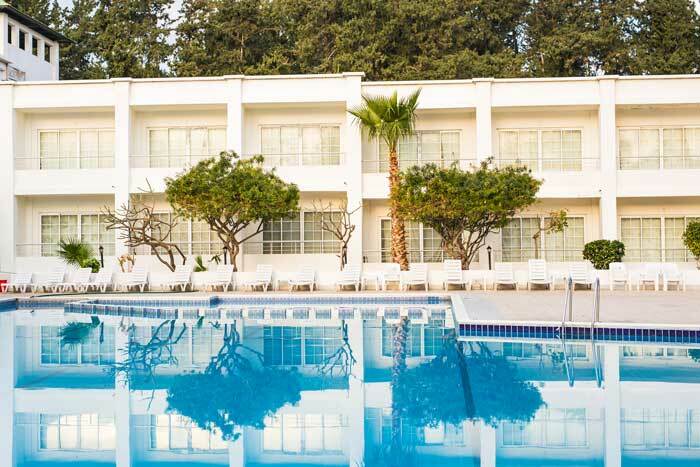 If the swimming pool is part of a real estate investment in the dream, or other somehow related to business or finance, it could symbolize you are considering new ventures in business or thinking about starting a new career. If you do not enjoy swimming in real life, or do not know how to swim, sometimes this dream can be about survival and how you will overcome and deal with challenges in your waking life. If you dream that you are struggling to swim or that you are trapped underwater in a dream, it is important to ask yourself whether you may currently feel overwhelmed by anything in waking life. Are you struggling to find a way out? Sometimes you can dream of being tired while swimming, or that you are not actually moving any distance but instead are just treading water. This can signify that you feel stuck in your current situation. You may feel like you are getting nowhere in life or that you are just trying to stay afloat in your finances. When you are facing challenges in life, whether they be through your finances or relationships, often times our dreams can help us understand a better way of dealing with these problems. Sometimes it means taking a new approach, other times the dreams appear to remind us that struggles do not last forever and there is always hope. Any body of water will have reflective qualities about it. 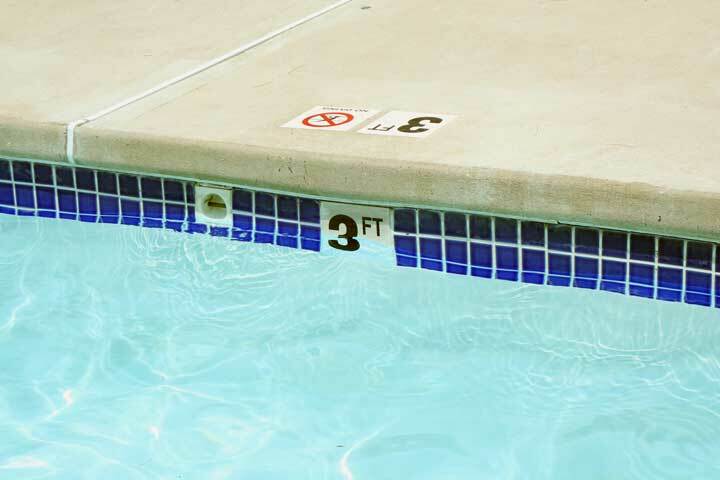 Many times in literature, pools are are used as a metaphor for illusions and reflections. Pools often can share the same meaning as a mirror as an illusion in a dream. If you notice a reflection in the water of the pool or you are able to see yourself swimming, it could mean that you need to take some time to think about how you feel inside vs. what you show to the outside world. Sometimes we keep many of our true feelings bottled up and hidden from others. Reflection can also have a double meaning, such as you are reflecting about your own inner thoughts. When you reflect on something, it usually means you are thinking about different possibilities or considering the truth of a situation. 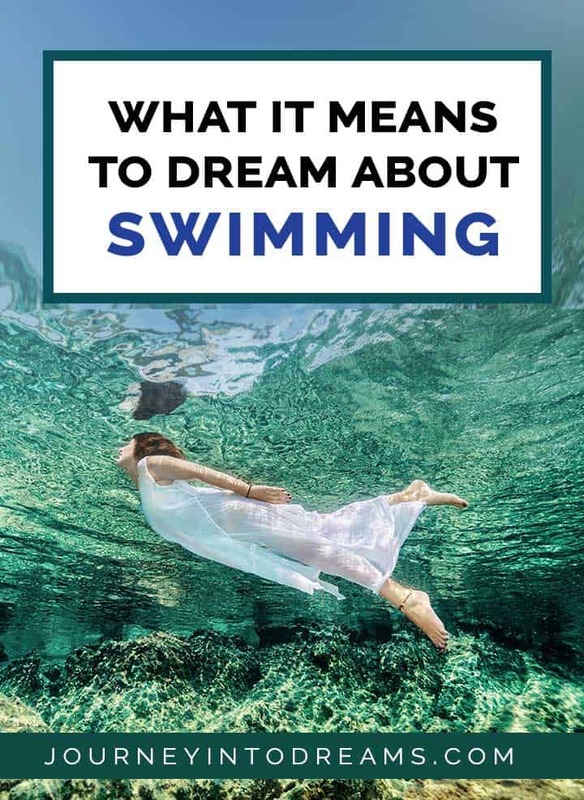 Now that we understand the basic themes of what it means to dream of swimming, we can look at some specific dream scenarios that might occur in different dreams. Swimming pools come in a variety of different shapes and sizes, with the most common shapes being rectangles, circles, and ovals. If you dream of a pool that has an interesting shape, it can be helpful to think about what this shape may represent. For example, if you dream of a pool with many curvy sides, it could mean that you are looking to explore life with less restrictive boundaries. It could also mean that you want to experience life more fluidly. Fountains in dreams can symbolize renewal and new cycles. It can also mean that you are looking to find a new source of information or insight in your life. Fountains in a swimming pool can also mean you are experiencing abundance, whether it is an abundance of money, abundance of friends, or abundance of feelings and emotions. Paying attention to other aspects of the dream can give you a better insight of what a pool fountain means in your dream. If you dream you are swimming alone, it could mean that you seek some time and solitude to better understand and explore your own feelings and emotions about a situation. You may feel that you are emotionally detached from a situation or from others in your current life. It's important to think about how you felt during the dream and how this may contrast with how you feel in waking everyday life. If you dream of a peaceful and serene, but completely empty swimming pool, it can mean that you feel like you are at a calm time in your life. It can also mean stillness and loneliness - perhaps you wish that you had others to share your life with. If you dream of emptying a swimming pool and draining all of the water out of the pool, it can mean that you feel as if you are emotionally drained in some situation in your life. You may feel like you are giving more than you are capable of providing. You may be putting others needs ahead of your own. If you dream of filling a swimming pool, this means you are likely starting a new venture, or that you feel emotionally fulfilled in life. You may be excited about new projects or prospects about to happen. While most swimming pools are outdoors, there are also many that can be indoors. Most of the time these types of pools are found in vacation resorts, hotels, or even the private pools of mansions. Swimming in an indoor pool often means you need to do some reflecting on your deeper inner emotions. You may feel like you are closed off from the outside world or that you wish to hide from others. An indoor swimming pool could also mean that you are overly sensitive to the current environment in your daily waking life. Perhaps you are thinking too much about appearances and not exploring your true emotions. You may not be doing what is true to your heart. Public swimming pools can be crowded and noisy places. If you are naturally extroverted, this may not bother you and you may enjoy the many different things to see and observe in the dream. 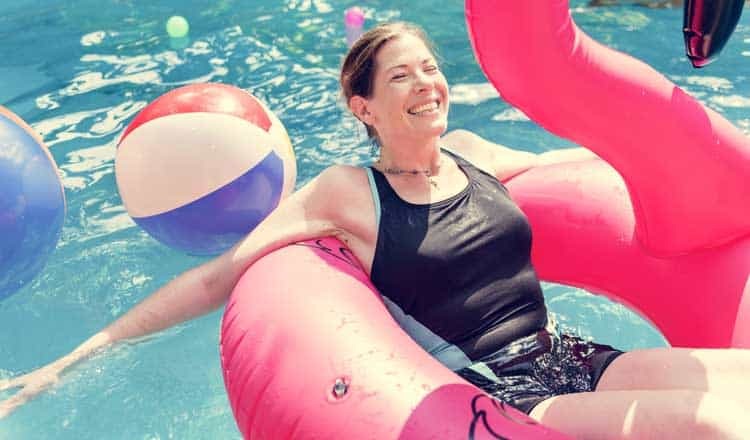 If you are an introvert, dreaming of a crowd of people in a swimming pool can mean that you feel like you are lost in a crowd or do not feel like you take enough time for yourself. You may feel like you are putting other's needs and interests ahead of your own. A dirty swimming pool, or dreaming of cleaning a pool can often mean it is time for you to release pent up emotions or change some aspect of your life. Changing a pool filter may be a symbol and metaphor to look at what you may need to change in your own life. Perhaps you need a new perspective to see through a situation in your life a little more clearly. Swimming in a lake or ocean can mean that you are experiencing something very natural, but you are not sure how to really navigate through all of the different feelings associated with the situation in your life. This can also sometimes be a dream that signifies a yearning to connect with a more natural way of life or to spend time outdoors. If you dream of a diving board or otherwise jumping and diving into a swimming pool, this could mean that you are excited to start new projects. This can mean that you feel confident about how a situation will turn out. Pay attention to the diving board: Is it high? Low? Does it seem unsafe? Your own feelings during the dream will provide many clues as to what the dream may mean. This can give you insight on how you might feel when you are "jumping into things" in your everyday waking life. Are you diving into shallow water? This dream may serve as a warning. It could mean that it is important for you to carefully consider the environment and other factors before starting a new project or committing to a decision. The phrase "dive on in" means you are immersing yourself into a project or situation head first. Sometimes this means you may not be fully thinking through all of the different issues that may affect the current things happening in your life. Diving in a pool in our dreams can also mean that you are so fully immersed in something you may be ignoring other factors that may contribute to the overall outcome. Competitive swimming in dreams can mean that you long to feel part of a team or that you are trying to reach a specific goal. Swimming is a competitive sport, and a very popular one in schools as well as the Olympics. If you dream you are on the swim team when you are a part of a competitive swim team in real life, it likely means you are thinking about your current goals or feelings about the sport. If you are not a part of a team in real life however, it could mean that you long to be part of a group or community. Sometimes it can also mean you are competing with others towards a common goal. It can be helpful to think about who you might be competing with in your relationships or career. For example, you may feel like a co-worker is always trying to "win" or perhaps you are trying to win over a romantic interest. Sometimes in dreams of swimming, you may notice fish or other animals in the dream. Dreaming of fish can mean a lot of different things, especially because there are so many different types of fish! If had a dream of swimming with a fish, looking at our posts on the dream meaning of fish and aquarium dream meaning can give you more insight on what the dream means. In these types of dreams, it's important to think about the symbolism of the animal and what wisdom it may contribute to the overall interpretation of the dream. This might seem like a strange dream, but many people dream of swimming in things which are not water. For example, people may dream of swimming in foods such as milk, spaghetti or jello. If you dream of swimming in food, it can be helpful to look at the related symbol for the dream interpretation for food. Other common non-water dreams that involve swimming might be dreaming of swimming through money. If you dream about swimming through coins, it can be very useful to explore the dream meaning of money. This can sometimes mean that you are thinking about how to improve your financial outlook or you are hopeful about current business investments. Are there any numbers present in the dream? See meanings of numbers in dreams. When you are interpreting what it means to dream of swimming, it is important to consider sometimes the literal/metaphorical translation of different sayings and phrases. It's also helpful to think of different pop culture references from books, movies, and music. Swim Against The Stream/Swimming Upstream: This is a phrase that means you tend to do things unconventionally. Your personal viewpoints may conflict with someone else's, or your way of life may not be accepted by others. It can also sometimes mean that you are doing something in a way that is a lot harder than it has to be. Swimming With the Fishes: This is an expression that you sometimes associate with old mob crime movies, in which a gangster will tell the boss, "Don't worry, he'll be swimming with the fishes by morning". In those movies, that usually meant the gangster would be dumping the body or crime evidence in the river or bay. This could mean you are looking to get rid of incriminating evidence or that you feel guilty about wronging someone. Sink or Swim: This phrase means that you can either do nothing, and fail, or you can try to reach success by swimming. This often means that there is some sort of challenge in your life that you must try to overcome, otherwise you may experience failure. Swimming With the Current: This means you are doing what is natural and what comes easily. You could be going with a traditional and conventional method in your life. You do not like to upset others, and will go with the flow to do whatever causes the least amount of resistance in life. Swim With Sharks: This is a saying that means you are associating yourself with dangerous and difficult people. It sometimes means you know you are entering a bad situation and are well aware of the associated risks. Pool Hopping: This was a prank that many teenagers did many decades ago, where they would sneak into their neighbors pools late at night. While this practice is of course illegal as trespassing, not to mention dangerous, the phrase is still sometimes used today. This can mean that you are exploring many different options, or you are sampling a little bit of everything before settling down on one decision. Pool Shark: A pool shark is someone who is involved in the betting in a game of billiards. These individuals were notorious for being dishonest or manipulative, although it can sometimes mean someone has a lot of natural talent in playing the game. If you dream of a shark in a swimming pool, you may want to think about whether there is someone you do not trust. Sometimes swimming can manifest in our dreams in the strangest of ways, but when you consider external influences, sometimes it all makes sense. Swimming is an Olympic Sport, and Olympic sized swimming pools are huge. If you have dreams about a famous swimmer, such as Michael Phelps, it could mean you are thinking about reaching fame or succeeding in your career path. If you dream of swimming while the Olympics are happening in real life, it could simply just be a coincidence, or it could mean that it reminds you to think about your own dreams and goals. 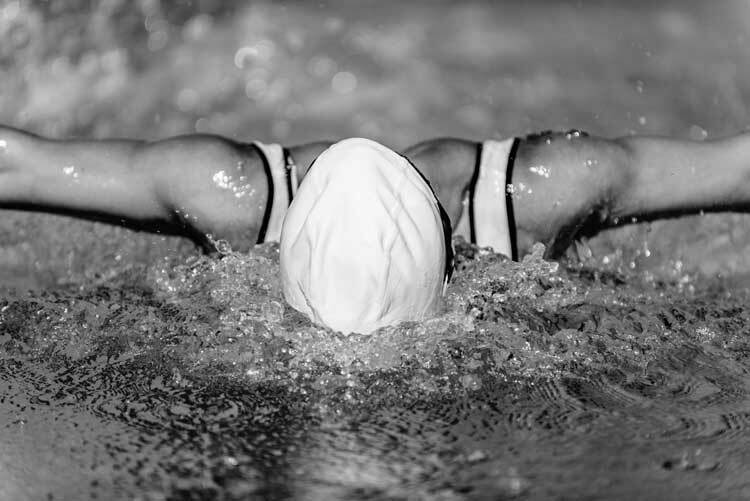 Many professional swimmers who compete know a number of different strokes. For example, there is the backstroke, the butterfly stroke, the sidestroke and many others. Sometimes these words can give you additional insight on what a dream means. For example, if you dream of the backstroke, it could mean that you are trying to find ways to do something easier, or you are turning your back to your own true emotions. The butterfly stroke could mean that you are not committing or that you are trying to make a great transformation and metamorphosis in your life. Swimming Goggles: Are you seeing things in life clearly? Are you able to see what others may not see in a situation? Swimsuit: A swimsuit, or lack of one, could mean that you are concerned about your appearances or you may be wishing to cover some part of yourself up. Pay attention to the colors of the suit, as there are many meanings of different colors in dreams. Swim Towel: After you get out of the pool, do you reach for a towel? A towel in a dream may suggest that you are looking to find some comfort in your life, or that you are in need of changing your current emotional state. Did you dream about swimming? What do you think it means? Share your experiences about swimming pools and swim dream meanings in the comments section below!